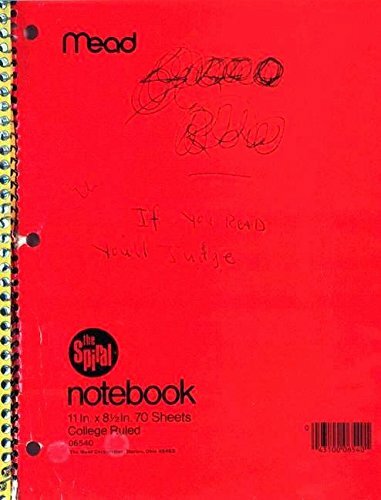 Presents lyrics, drawings, letters, and other writings from Kurt Cobain's journals, revealing his thoughts on Nirvana, fame, fans, and the state of rock music. I'm a sucker for diaries. This was no exception, all handwritten too! Funny, distrubing and sad all in one. The book showed me how Kurts mind worked, and showed me how an artist sees the world compared to the normal layman. Obviously there is no story to speak of, just thughts from himself. Interesting, mildly. His personal journals; I could relate, as a teenager, but now it seems like nonsense (as do my own journals from that age). I notice the editor isn't named. You do get a sense of the author. Whether this is a true image is of course open to debate. I'm not convinced that a man's private and random jottings are a valid basis for judgement, nor even that these things should be made public. The impression you get is of an uneducated, immature and confused man. He lets vent to such hatred against people for being what he himself is and does, banging on about his white guilt and how he's going to change things from within. He can be funny in a darkly ironic way but there's a truely dark and revisionist side here. You can see him degenerate as his drug use takes hold.